When we moved to Virginia 4+ years ago, my momma told Brian and I about an incredible pie experience she’d had years prior at a little restaurant in Staunton, about 45 minutes from Charlottesville. She waxed poetic about an apple pie better than any she’d ever had, including her grandmother’s recipe which had previously held first place on her pie-ranking list. We were encouraged to drive over the mountain chain separating us from Mrs. Rowe’s Restaurant and Bakery one Saturday for a special treat, to indulge in one, or maybe even two slices of a pie that still had a mouth-watering affect on her all these years later. The restaurant and its legendary pie quickly slipped my mind as we moved into a house and started new jobs, busying ourselves with life in Charlottesville and the many culinary delights we have in this little city. I hadn’t thought of my momma’s story in 4 years, until I attended the C’ville Pie Fest and learned of Mollie Cox Bryan and the cookbook she’d written about Mrs. Rowe and her pies. I didn’t have the opportunity to meet Mollie as I was busy photographing and she was busy judging, but we did get in contact with each other afterwards via Twitter and she generously offered to send me a copy of her book to aid me in the kitchen during Bella Eats Pie Month. The cookbook arrived on my doorstep a few days later, and I was delighted by what I found as I immediately began flipping through its pages. 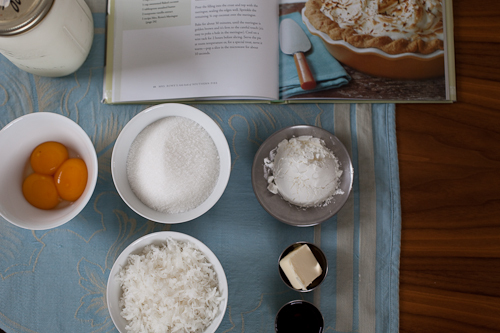 Mrs. Rowe’s Little Book of Southern Pies is lovely with a simple, intuitive layout and beautiful photos of many of the featured pies sprinkled throughout. Mollie starts by introducing her reader to Mildred Rowe and the Staunton restaurant, describing the space and the woman behind it with clarity and detail that only someone who has spent much time there could. The reader is then taken through one section detailing pie-making equipment and another describing techniques for various crusts and toppings. While the Plain Pie Pastry and Vinegar Pie Crust recipes seem simple enough, Mollie points out that the light touch of an experienced baker can take years to master. I plan to continue practicing. 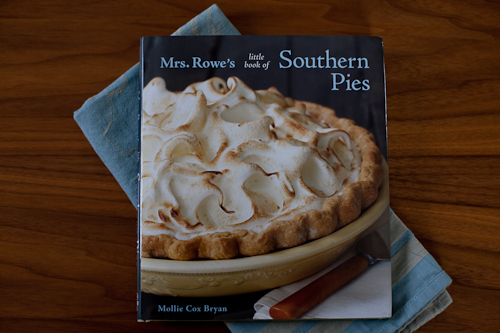 Despite its petite size, Mrs. Rowe’s Little Book of Southern Pies is packed with useful tips and 65 recipes, some straight from Mrs. Rowe’s Restaurant and Bakery and others from journals found during Mollie’s research. 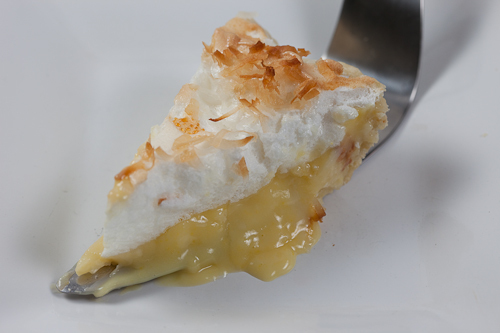 Restaurant favorites such as the Original Coconut Cream Pie, Chocolate Meringue Pie, Peanut Butter Pie and French Apple Pie are all present along with some classic Southern varieties like Shoofly Pie, Lemon Chess Pie and Blackberry Pie. Each recipe is accompanied by a small tidbit of history, a direct quote from a member of the Mrs. Rowe's team or a memory from a loyal customer. The book is personal; peppered with heartfelt writing and recipes that are sure to remind you of a special occasion in your life, when a certain pie was served to a table full of your closest family or friends. 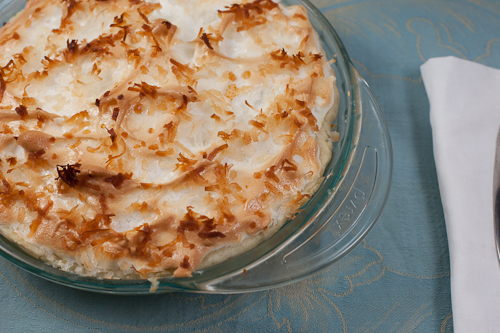 I chose to tackle the Original Coconut Cream Pie recipe rather than the apple variety my momma had raved about. As the best-selling pie at Mrs. Rowe's Restaurant and Bakery it seemed to be a safe bet. And, I really wanted to try my hand at meringue, a baking challenge I hadn’t yet subjected myself to. I found the recipe to be fairly easy to follow, although previous experience baking cream pies might have been helpful to me. Where the recipe called for a mixture of milk, sugar, cornstarch and egg yolks to be heated and stirred until "very thick", about 4 minutes, I had no frame of reference in mind for what that consistency should be. Having reached 6 minutes with a pudding-like consistency, I pulled the mixture from the heat thinking it would thicken up more when baked. No such luck. Upon slicing, the cream filling oozed from the center of the slice into a pool on the plate. Clearly my idea of "very thick" was not thick enough. The meringue, however, was absolutely perfect. The runny nature of my pie was most certainly the result of my own lack of experience in cream pie baking and not the fault of the recipe itself. Here are my notes for the next time I tackle a cream pie. Many cream pie recipes call for the use of a double boiler when heating and thickening the cream mixture. A double boiler is basically two saucepans that fit together, allowing water to boil in the larger pan with your cream mixture heated in the smaller pan set just above the boiling water. I realized after this latest pie-making adventure that my "double boiler" is not really a double boiler in the traditional sense. I think it hindered my process rather than helped it, and believe I would have been better off setting a large stainless steel bowl containing my cream mixture over a large saucepan containing boiling water. If you're shopping for a double boiler, find one that looks like this, rather than like this. Or, just set a stainless steel bowl over a saucepan. When heating and thickening the cream mixture, the texture is more important than the time it takes to get to that texture. As I learned, all stove tops and double boilers are different, so it could take more or less time to reach the desired consistency depending on your situation. You're going for a thick, custard-like consistency. It shouldn't be runny at all, should fall from a spoon with a thick "plop" rather than run off of the spoon with any resemblance to liquid. Don't let the milk actually come to a boil as you're heating it, you don't want it to scald. 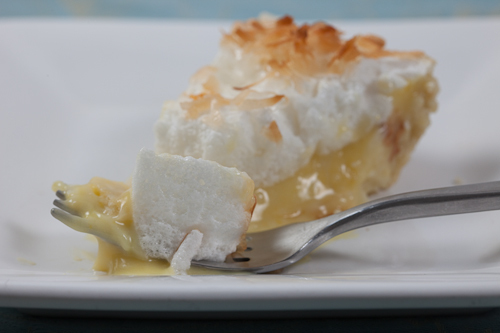 Your meringue will take more or less time to come together depending on your environment. Mine took about 10 minutes of consistent beating with a stand mixer (whisk attachment), on a cool, rainy day. When making your meringue be sure to add your sugar slowly, as it is important for all of the sugar to dissolve into the egg whites between each addition. Meringues are subject to "weeping", when the sugar solution comes out of the meringue in little droplets. This happened with mine, and after a little research in The Joy of Cooking I discovered that it is more likely for a meringue to weep on a humid day. It still tasted delicious, there were just small droplets of liquid sugar sprinkled across the surface of the meringue, and it wasn't as dry to the touch as you would expect it to be. Be sure not to overfill your pie crust with your cream filling. Leave at least 1/4-inch of the crust exposed to be sure your filling doesn't overflow. Also, when you add your meringue to the top of the filling it can cause overflow, so it is good to have a little bit of wiggle room as you design your topping. Meringue can be shaped with a spatula in any way you wish. Smooth it over, swirl it around, form fancy little peaks. Let your inner artist shine! Seal the edges of your meringue by wetting your finger with cold water and running it over the rim of your crust. Press the meringue down into your crust to help prevent weeping and potential filling overflow. I've written the recipe as it appears in the cookbook, but see my notes above to learn from my mistakes. Stir together the egg yolks, sugar, cornstarch and just enough of the water to make a smooth paste. Heat the milk in a double boiler set over simmering water. (Or, place a medium-size stainless steel or glass bowl into a large saucepan filled with a couple of inches of simmering water.) When the milk begins to steam gradually whisk in the egg mixture. Cook, stirring occasionally, until very thick, about 4 minutes. Remove from the heat and stir in 3/4 cup of the coconut, the butter and the vanilla. Set aside. Make your meringue, see below. Pour the filling into the prebaked crust and top with the meringue. Seal the edges well by wetting your finger with cold water and running it along the edge of the crust, pressing the meringue into the crust as you go. 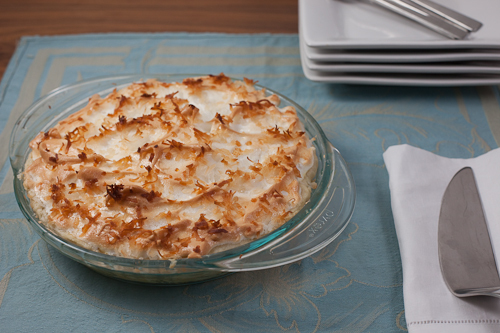 Sprinkle the remaining 1/4 cup coconut over the meringue. Bake for about 30 minutes, until the meringue is golden brown and its firm to the careful touch (its easy to poke a hole in the meringue). Cool on a wire rack for at least 2 hours before slicing. Combine the egg whites and cream of tartar in a chilled bowl and beat with an electric mixer on slow speed. Gradually increase the speed as the egg whites thicken, eventually landing on medium speed. Beat until soft peaks form. Add the sugar 1 tbsp at a time, beating for about a minute after each addition. Beat until stiff peaks form, but not so long that the peaks become dry. The meringue is now ready to pile lightly over the pie. And that concludes Bella Eats Pie Month! 5 weeks, 5 varieties, and 5 pounds later, I've learned so much and hope you have too. Please write and tell me about any of these or other pie recipes that you try out this holiday season. I'd love to hear from you.